The present general sales and delivery conditions are systematically brought to the attention of every customer to enable him to place his order. 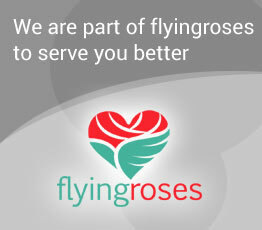 Consequently, the placing of an order implies the full and unconditional acceptance of these general conditions, notwithstanding any other documents, such as sales brochures or catalogs issued by FlyingRoses.com or any of its related websites, which have only an indicative value. The buyer may therefore not impose any contrary conditions on the vendor, unless expressly accepted, regardless of when they were brought to his attention. Order Acceptance Policy: If a same day delivery is requested, and provided we receive the order before 1PM (Local time at destination), we will do our best to deliver the item, otherwise it will be shipped the next day. Your receipt of an electronic or other form of order confirmation does not signify our acceptance of your order, nor does it constitute confirmation of our offer to sell. We reserve the right at any time after receipt of your order to accept or decline your order, mainly when a credit card is suspected for fraudulent activity. We reserve the right at any time after receipt of your order, without prior notice to you, to supply similar items of same value, in case of no availability, mainly during same-day order requests. We may require additional verification or information before accepting any order. Shipping and Delivery: Deliveries can be made only to the listed regions. Same-day delivery conditions can be found on each product page. For some products, delivery on Friday or Sunday is not available. 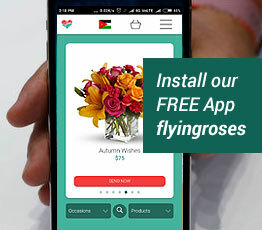 In most cases, FlyingRoses.com will call the recipient to agree on the time of delivery; however if the addressee is absent, we may leave the parcel at the front door or leave a message in the mailbox. Orders will be delivered any time on the requested date from morning to evening depending on the delivery schedules and depending if the recipient answers our calls to coordinate the delivery; if you request a specific bracket for delivery – before 2pm or after 2pm, we will do our utmost to honor your request if possible. During Valentine (Feb 14) and Mother's Day: Orders received on the same day or during the night before will be processed on best effort basis and might be delivered the next day, so please order at least 1 day ahead. Also for orders on these 2 occasions we cannot commit to specific delivery times as we will be dispatching throughout the day but we will always call your recipient to coordinate the delivery. Order Cancellation: A full refund is provided for orders cancelled more than 48 hours prior to delivery, otherwise the full amount will be charged or kept as credit on a case-by-case basis. Substitution: Substitutions may be necessary to ensure your arrangement, cake, or specialty gift is delivered in a timely manner. The utmost care and attention is given to your order to ensure that it is as similar as possible to the requested item. - Flowers: In arrangements of assorted flowers, the colors shown online will be used if at all possible, even if this means substituting other kinds of flowers of equal or greater value. For one-of-a-kind flower arrangements, such as all roses or all lilies, we will make every attempt to match the flower type, but may substitute with another color. If the floral container shown online is not available, a similar container will be used. - Plants: For green and blooming plants, similar plants may be substituted of equal or greater value. For one-of-a-kind plants, such as orchids, we will make every attempt to match the plant type, but may substitute with another color. If the plant container shown online is not available, a similar container will be used. - Cakes: Sometimes substitutions may be unavoidable depending on local availability and regional constrains. Especially when the order is for the same day or if delivery destination is of a small city where the bakeries are not so well equipped. - Specialty Gifts: Specialty gifts may be substituted with another specialty gift of equal or greater value and of similar theme and category. Product Return Procedures: For non perishable items, any returns must be subject to a formal agreement between FlyingRoses.com and the buyer. For any returns accepted by us, in the case of a visible defect or the non-conformity of the products delivered, we will allow the buyer to obtain the free replacement or the restitution of a credit note to his benefit, exclusive of any other indemnity or damages. - Flowers, plants, and other perishable items delivered to incorrect addresses supplied by the sender. - Unsuccessful deliveries arising from the recipient not being present at time of delivery at the address supplied by the sender. - Decreased product quality due to an incorrect delivery address supplied by the sender, or a re-route requested by the sender. - Product quality problems caused by improper handling by the recipient.